In a few weeks’ time, employees and PhD students can expect to receive an e-mail from the vice-chancellor. It will then be time to complete the employee and PhD student survey. A few years ago, the employee survey and the PhD student survey, for those employed as PhD students, were combined into one. Other PhD students complete a survey designed solely for PhD students. 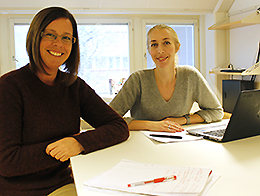 “The PhD students appreciate that they do not get two different surveys at different times, so we intend to continue with this structure,” says Monika Rissanen. This year Sophie Dufwenberg at the Study Administrative Office is responsible for the PhD student survey. “We have modified and clarified some questions in the form used in the PhD student survey in order to make the results easier to interpret. And we have adapted the English version considerably, so that it reflects the Swedish version more closely. The reply frequency last time was 77% for employees and 63% for PhD students. For more information, see the FAQ, which contains questions and answers about the employee and PhD student survey. 12 April: Results presented at the University Hospital Campus and Campus Norrköping. If you want to see the video with English subtitles, click on the cogged wheel in the lower right corner. In the menu that then appears, click on “Undertexter (2)” and then select “English”.